How Can We 10x Global Creativity? 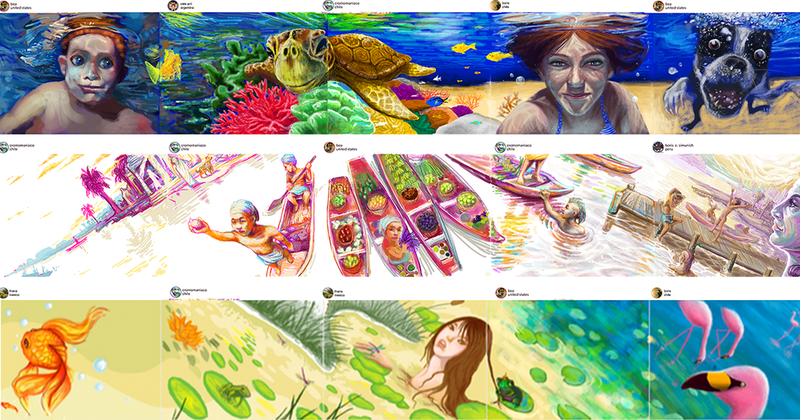 Drawing created by artists from around the world on the Dada platform. I just accepted an official advisory role with the drawing-based social platform Dada.nyc because I believe with our help they can 10x our global creativity. Here is why I believe this. We have greater than 15x the world population than we had during the Renaissance. Modern medicine has extended our lifespans, and technology and innovation have introduced leisure to a much larger group of people. So why do we not have at least 10x the Michelangelos and Raphaels and Da Vincis? Could it be we are failing to support the arts in a manner that allows for artistic geniuses to fully surface? If we took the $450M spent on a single Da Vinci painting, Salvator Mundi, and reallocated it to supporting and growing this generation’s artists, could we surface 10x the number of modern day Da Vincis? I actually don’t think we need $450M - it may be easier than that. I think the key to 10x-ing the world's artistic output is quite simple. Just as a fast-spreading forest fire can start with three small things - heat, fuel, and oxygen - I believe artists need only tools, audience, and acknowledgement to catch fire. Without those ingredients most artists give up. I know I did. As an artist and a technologist, it has always been surprising to me that nobody has built a platform to meet these three basic artists’ needs. That was until I met my friends from Dada.nyc. I believe Dada is very far along in becoming the first platform to unlock global creativity. Where others might see a simple drawing tool, I see the opportunity to 10x the world's creativity and trigger a new global renaissance unlike anything we have seen before. Over the last four years Dada has brought over 150,000 people from all walks of life and geographies together to draw collaboratively. This is both remarkable and unprecedented. Yes, there have long been online artist communities and portfolio sharing sites on the web, but Dada is not that. Dada is a community of artists drawing together, extending each others' work, exploring, experimenting, and making mistakes/discoveries together. Where other sites are designed to share finished results (we never see how the sausage is made), Dada is skewed towards the artistic process - the making and building of creative muscle. Here is what you need to know about Dada to understand why I believe they have the potential to change the world. Bea Ramos (front right) regularly travels the world to engage directly with the artists in the Dada community. She knows their families, their personal challenges, and their failures and successes. I don't think you will see Zuckerberg traveling halfway around the world to show up at your door to cook a meal with you anytime soon. Building a platform and a community where strangers feel comfortable enough to be vulnerable and to create and share their work in all stages is remarkably tricky. The blank canvas is notoriously intimidating, and putting yourself out there to an audience you have never met only amplifies that. More than technological advancement, it requires extremely thoughtful and sensitive leadership to build this type of platform. Beatriz Helena Ramos, founder and CEO of Dada, is that leader. With their new funding from Consensys, they now have the potential to scale these elements and expand their reach and change even more lives for the better. But isn't Dada.nyc Just Amateur Doodles? A few of the people I have sent to Dada have come back to me suggesting the art on Dada are just doodles and sketches from amateurs. They are wrong. Considering how simple the tools are in Dada, the results can literally be mind blowing. For example, take the drawing above by Dada artist Boris Z. Simunich. Boris was inspired to draw this realistic portrait of a stray dog to encourage people to consider adoption… and he drew it with a computer mouse! I include his art here to show there is literally no ceiling for the quality of work that can be produced in Dada using very basic tools when they are put in the right hands. However, the goal for Dada is not for just the most talented artists (like Boris) to produce highly polished digital masterpieces... rather the goal is for everyone to benefit from drawing and creating art together in a supportive community. I believe that art appreciators/consumers have developed an unhealthy desire to quickly classify artists and the work they create as "good" or "bad." This boolean approach to art appreciation completely misses the boat, failing both appreciators and the artists who need their support. What artists know that others often don't is that doodles and sketches are actually the fuel of all artistic production. 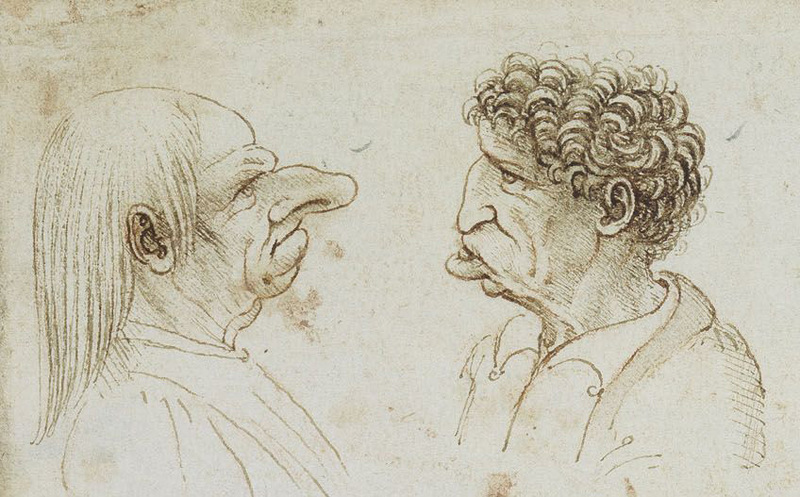 Da Vinci was known to sketch grotesque heads and other seemingly awkward, silly, or throwaway-type drawings. But these sketches are amazing in their own right, and the process of drawing regularly and freely has long been a staple of all great artists’ practice. As an analogy, your daily morning jog is not the Boston Marathon, but without it, nobody ever gets "Marathon Ready." Art is exactly the same: it takes regular practice to improve. Practice is important for building technical skill and draftsmanship. More importantly, sketching, while less self-conscious, helps to free up the imagination. The Surrealist artists knew how important sketching and doodling were to unlocking the creative ideas from the subconscious. They famously played a drawing game called the cadavres exquis, or exquisite corpse. In this game an artist would make a drawing and fold the paper such that the next artist only saw the very edge of the image so they were extending the previous drawing without knowing what they were adding to. Dada operates on a variation of this game where you can actually see the drawing from the previous artist and you are encouraged to extend it visually and through narrative. Dada is playing this game across the globe with artists from countries all over the world participating. The humble "sketch" or "study" is also the foundation for all of the greatest masterpieces. While we sometimes like to imagine that great artworks arrived through some sort of immaculate conception, appearing out of the ether through unparalleled artistic genius, this is never the case. The studies below are a good reminder that the most important works by our most celebrated artists where built up from sketches - in some cases dozens and dozens of sketches for a single painting. c.1891-2. , pencil on paper. Beyond building artists’ skills, enhancing their creativity, and creating studies for future masterworks, developing a regular sketching habit can provide a much needed outlet for dealing with depression, anxiety, and the struggles of everyday life. It is important to recognize that 10xing global creativity, as ambitious as it sounds, is only the starting point for Dada in my opinion and far from its loftiest goal. I am passionate about art history and collecting art, but I recognize that the truly transformative power of art comes from “making” as a therapeutic and creative outlet. I know this because when I was a teenager, I struggled with anxiety and depression and often could find no purpose or value in life. Art gave me purpose and an outlet as it has for so many others. 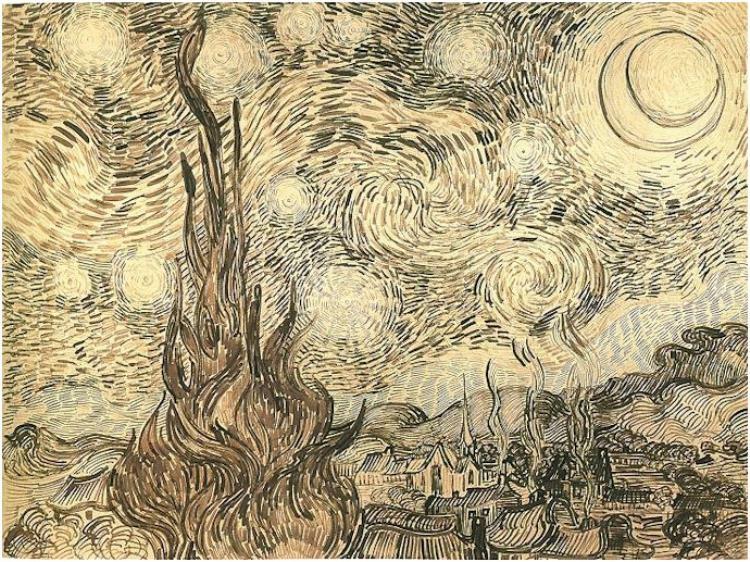 It's no secret that many of our greatest artists suffered with mental illness. Art is a natural salve - as has been said "comforting the afflicted and afflicting the comforted." I can think of no higher purpose for art than getting the tools for creation into the hands of the suffering. Add to that a community of supporters and what you have is nothing short of transformative. Much of the horrible things we see in the world are the results of people feeling disconnected and lacking an outlet for their frustrations. Dada has opened its doors with a ready-made environment designed for creative outlet to everyone and anyone who needs it. Art saves lives by making them rich, full, meaningful, and worth living. It's hard to want to bomb a country or build a border wall when you've just collaborated on a drawing with someone who lives in that country. Creative collaboration is an incredibly powerful force for bringing people together, and it humanizes people who may otherwise seem too different or distant to care about. Additionally, by bringing artists together from around the globe, we see styles and cultures visually influencing one another in real time to a degree we have seen nowhere else. Somehow Dada has opened its doors to everyone and there are no trolls. Whatever the formula, Dada should be looked to as a blueprint for healthy, global, collaborative engagement. Many of the world's most intelligent and successful entrepreneurs have warned that artificial intelligence (AI) and machine learning will soon be able to take over many of our jobs. One area where most agree that AI will not be able to replace us is in creativity and the arts. But despite this realization, we regularly see the arts as the first programs cut in public schools and unenlightened leaders like Donald Trump cutting back on arts funding. Scalable platforms like Dada have an opportunity to educate a future workforce that will need to be able to think creatively and communicate globally to thrive in the new economy. ...you can now do all of them at once for as little as $9 by purchasing a drawing in Dada's gallery. If you consider yourself a supporter of the arts, or would like to be, this will be the best $9 you ever spent. To purchase you will need to install Metamask and acquire some Ethereum. This may sound super overwhelming if you are new to it, but trust me, it is not and Dada have provided easy to follow instructions. You can learn more about blockchain and art in my earlier article here, and if you have questions on how to make a purchase the folks at Dada are happy to walk you through the process. If you enjoy Artnome and have ever wanted to a way to say thanks, skip a few coffees at Starbucks and buy your first digital drawing on the blockchain at Dada. Can't afford to collect just yet? No worries, make a drawing or leave a positive comment or a like for one of the artists - it will make their day and yours, I promise you.